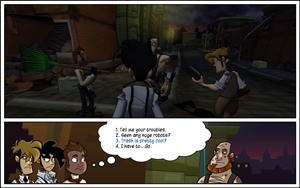 Penny Arcade Adventures, the four-episode gaming installment of the popular webcomic is coming to a premature end. Penny Arcade Adventures was first unveiled at PAX 2007, with the first two games of the proposed quartet released in May and October, 2008. With the subsequent time gap and the second game only making one-third of the sales the first game did, the series showed signs of struggle. "There won't be an Episode 3," Penny Arcade illustrator Mike Krahulik said. "We're actually not making a third episode of the game." In addition to waning sales, Adventures developer Hothead is working on a new title, DeathSpank, in conjunction with EA Games. The Penny Arcade team felt the studio had a great opportunity with DeathSpank, and making Penny Arcade Adventures Episode 3 would cause the quality to suffer. "They definitely could've done both games," Penny Arcade writer Jerry Holkins said. "I think they could've made DeathSpank and Episode 3 but I think Episode 3 would've suffered. I mean, I know it would have suffered. So we'd rather not do it than do it half-assed and so we're going to finish that story but it's going to be on our website." How will they finish the story? Penny Arcade will release an illustrated episodic version of the remaining story to help finish the tale Adventures set out to tell. "Our main goal at this point is to make sure that people aren't left hanging on a narrative side, and to allow Hothead to do the best they can on their project," Holkins said.